I was never a big Chicken Noodle Soup fan growing up. We were a Campbell's condensed soup family (Come on now, it was the 70s. No judging. ), so give me Chicken and Stars any day. I remember, sometime in elementary school learning a song called "Chicken Soup with Rice" and my dad bought cans of Chicken with Rice after that. I don't know, the ratios always seemed off. Too many carrots (of cooked carrots, I am also not a fan), not enough chicken, noodles too gummy and hard to eat. No, for me, Chicken Noodle Soup never completely caught on. However. I get it. I get that there's not much more comforting that the bland, barely spiced bowl of warmth that is this soup. Something subtle and easy on the tummy. So when we were all under our rock last week it was the first thing I thought to make us. 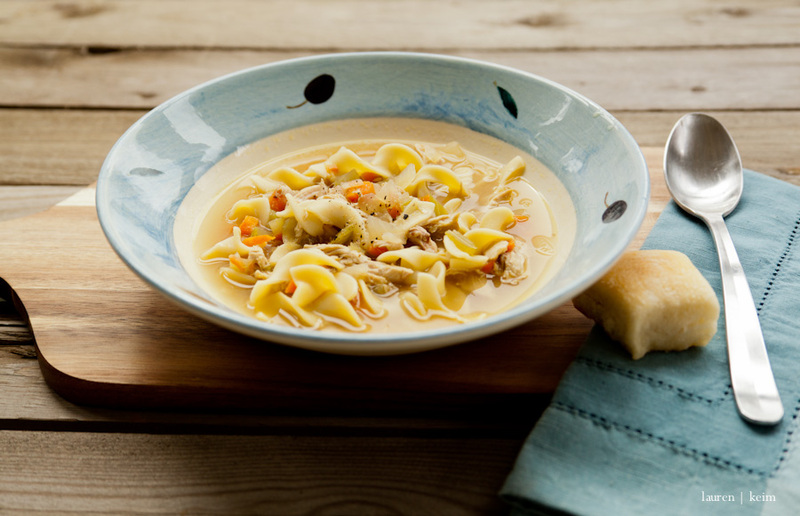 There are a gazillion ways to make Chicken Noodle Soup and get it rich and flavorful, to elevate it to an art. Was I prepared to do that? Uh. No. Heck, even now I'm still contemplating a nap at any moment. I needed something easy, comforting, nourishing, flavorful (but not too flavorful), and did I mention easy? Here's what I came up with. Saute´the vegetables in the olive oil in a stockpot over medium heat until soft. Of course you can chop an onion, a carrot or two and a few stalks of celery, but I was looking for maximum easy so I grabbed the pre-chopped pack that our grocery store carries. While the vegetables are sauteíng, shred some of the chicken from the rotisserie chicken. I ended up using maybe a cup and a half of both white and dark meat as well as some of the skin. Once the vegetables are soft and just beginning to brown, deglaze the pan with some of the sherry. 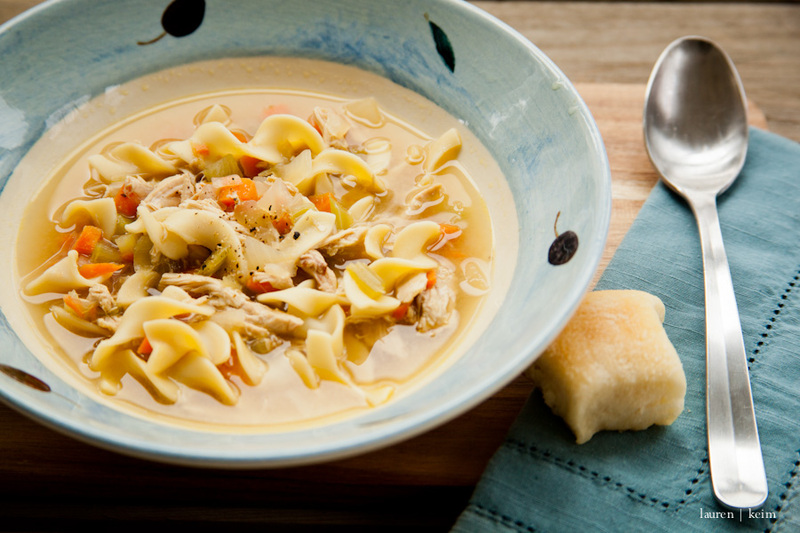 Add the chicken and enough broth to reach the volume of soup you desire. Bring to a slow boil. Once the soup is boiling, add the noodles and cook until just tender. Taste and adjust seasonings. 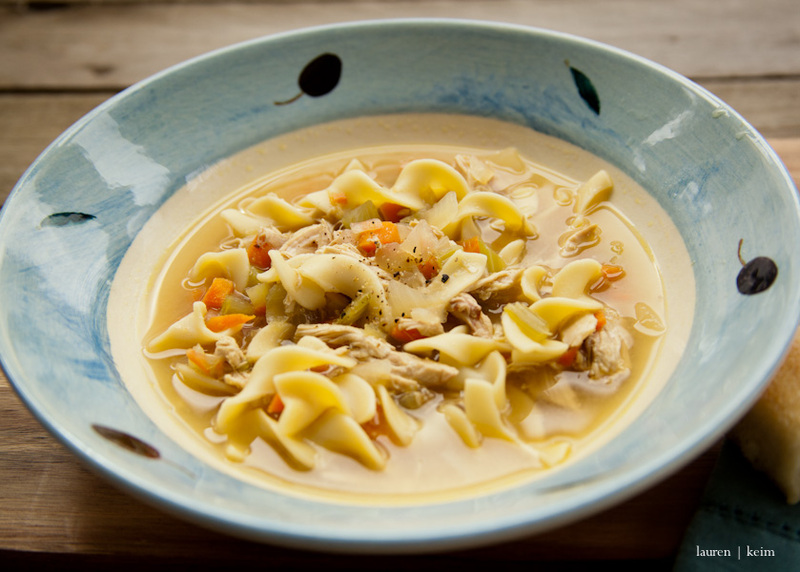 With the chicken and broth, it should be plenty salty, but you may want to add more sherry and some fresh ground pepper. Serve with warm rolls to sop up the broth. And feel better!